Many times while on MUA, I will post pictures of nail designs & TONS of funky frenches. I often get asked just how I do it. So here is my step by step for you guys. Here is the mani, I will be showing you how I did. The colors I used are Finger Paints - Tough Art to Follow & Savvy Green with Envy. First you paint your base color, this can be ANY color you want. You need to make sure it dries though. 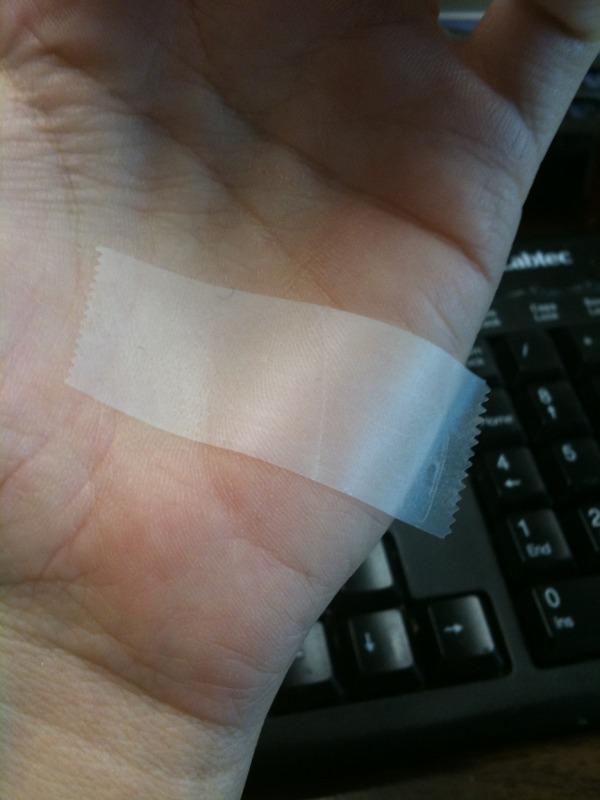 Then, I take scotch tape, and stick it to my palm. You will see later why I prefer scotch to painters tape. I stick it to my palm, so it takes away some stickiness, and doesn't pull up the base color. 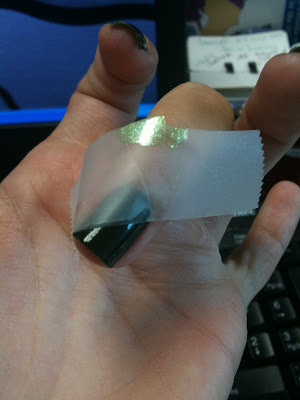 Then I tape it onto my nail, in the desired design, here it is my diagonal design. Remember to do 1 nail at a time, otherwise the 2nd polish can dry to the tape, and pull up. Once you're done, painting the nail, just slowly pull the tape off. Then do this to the rest and Ta-Da, you’re done. I hope this helps, and is easy to understand. I'm not the best at explaining the process. If you look back at some of my past manis, you will see I use this technique a lot. I love my funky frenches, and for them, you just tape the nail off, leaving the tip open and free to paint the color of your choice. Do you wait until the polish is dry before you take off the tape? ** sorry wrong reply!! i meant to say you wait about 20 seconds for quick dry and 45 seconds for regular nail polish.. <3 hope it helps! Hi. I am a sign artist and graphic designer and past custom painter and pinstriper who now paints his own nails. I am heavily tattooed looong hair and a serious biker as well. I have started to paint my nails openly in public fir the last 3 years. Till then it has only been at home indoors with my ex wife. Anyway. I have been blown away by your designs and quality of the neatness of your applications. Recently started to do taping designs and have used instead of scotch tape,ive used Finesse brand pinstriping tape for my designs. Being a former custom bike and car painter, i have tons of this stuff around. My one color jobs come out like glass and even make the women atSally Beauty and Walgreens cosmetics counter jealous of how perfect mine come out for a guy. I also use 3M Fine Line tape as well from the auto body supply shops as well since i have rolls of it lying around. Comes in any width Just thought id share my 2 cents of advice. Have a great day !!!! Wow. Your blog is awesome. I am enjoying browsing through and am learning some things too. No, you want to only do 1 nail at a time, and as soon as you paint the tip, you should remove the tape. If you wait to long, the tip polish will stick to the tape and pull up. my nails are usually too curved to tape off the tip for a french mani...is there any other way i could do it? You can always use a round make up brush dipped in nail polish remover and shape the line. The only downside to that is you can't have a base colour. But I end up with some very lovely tips. why DO you prefer scotch tape to painter's tape? I think it is the visibility "If you notice since the tape is clear, I can tell whether or not it is completely taped down correctly. So I don’t get any leaking underneath the tape." You did a great job of explaining the process step by step. I can't wait to try this...along with the patchwork mani. Great DIY blog post. I've never tried this and in the process of letting the first color dry. Thanks, Stephanie! Yay, I'm glad your trying it, and hope you love it! I discovered your blog and tried this technique tonight (I even posted about it over at my own nail blog, haha). I have a few questions, though! How do you deal with polishes (the ones being used with the tape) that require more than one coat? Hoe do you get the tape to stick to the edges of your nails? Mine kept lifting off a bit, or not sitting completely flush. How do you keep the layers from feeling.. Hm, I don't know the word. Like, being able to feel the build up of each layer, like a ridge? Thanks Kendal, and thanks for the shout out!! When choosing polishes for my tape manis, I try to choose one that are 1 coaters. If they do need layers, then I use them with black, and that way, when I use the sheer polish, I only need 1 coat over the black to get an amazing color. It is pretty tricky to get the tape to stick to the sides of your nail completely, but I just do my best, and it doesn't always work out, but I try not to get to picky, lol, otherwise I would do crazy :) As for the layers, and not having them look or feel uneven, I use a thick coat of SV after every layer, and this helps, everything even out, a lot! I finally managed to do a scotch tape mani that wasn't a total fail! yeah for me! Hi! I found your blog thru Brooke on YouTube and I read the whole thing last night! You are mega-talented and a great inspiration. I've tried twice since reading some of your entries and I think I'm getting the hang of it. But I've noticed that after I paint my top color and remove the tape, it tends to slide down a little in spots, quite unlike your perfectly straight crisp lines. Any ideas what I'm doing wrong? Welcome Ari!!! Thank you sooo much!! To mee it sounds like you might have too much polish on the nail. You should try to do the thinist layer possible. When tape is involved, I try to use polishes that are 1 coaters . I was thinking that might be it...it's still gorgeous and I got nothing but compliments at work today (with rightful credit given to you and your blog! ), so next time, I'll try something darker. Do you recommend any brands that have fun colors that are one-coaters? I love black and white tips, but I like to mix it up, too. Ari, oh good, I'm glad everyone loved them! Sally Hansen Insta Dri's are great 1 coaters, and they have tons of fun colors. Every time I tried to use tape to get perfect straight lines the nail polish would come off on the tape whenever I would take it off...until I saw this tutorial to stick it to your hand to remove some stickyness. I just did a french using that tip and it came out perfectly! One of my favorite blogs. Thanks! Jeessiicaaa, oh good, I'm so glad this helped!! i've been dying to try this and now that i've read your blog i'm totally doing it! 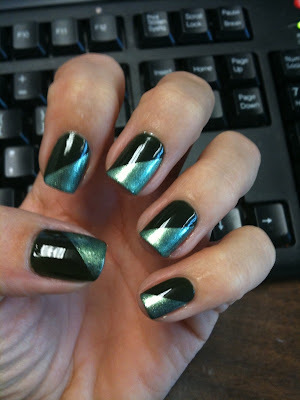 (as soon as i get sick of my gradient mani, lol) LOVE YOUR BLOG! Thanks!! Oh YAY, you should def try it. I just tried this with a funky french for the first time today (dark on dark, less noticeable mistakes :P), and was quite pleased with the results. The only thing I was wondering, is there any way to make this work better on "rounder" nails? My nails are more of an oval shape than a square shape. I don't think the tape would be so great for the rounded nails :( Unless you want to cut the tape into shape of your nail, which could be a pain. There are tons of curved french tip guides out there though, maybe those would work better. After you do the base coat, do you use the SV before you tape? Also, when you use the Konad kit, do you have to use their polish or can you use any polish? If using 3 colors. do you use the SV after each color is applied or at the very end? You're so talented. My friends and I are in awe! Keep up the amazing work! These are great tips. Hopefully we can come at least somewhat close to your fab nails. I did it last night and I was very happy with the results (more on my left hand than right of course lol but I'm getting there!) UNTIL I woke up this morning and saw the DISGUSTING shrinkage that SV gave me. It was my first time using it and I heard about the shrinkage but felt like it wouldn't happen to me, IDK why lol. Since I'm the type to change my mani once a week (I pride in able to make my mani's last) can you recommend another top coat? just tried my first tape mani -- just a simple french-style tip. it isnt perfect, but it looks decent! i had a few fingers where my base-color was peeling up with the tape. i was thinking it could be a few reasons: (1) base color wasnt dry, (2) tape was still a little too sticky, or (3) i didnt use a top coat after the base coat before i started taping. which reason do you think is the most likely culprit? either way, i will definitely try this technique again! EvaNadine, It could actually been all of them. I find that a top coat is a must for tape, but even if it hasn't dries enough or there was still too much sticky on the tape, it could pull the base up. Just did a simple tape mani. It came out great! I'm so happy. Too bad polish doesn't last too long on my nails and I don't have any type of top coat as of right now. ]: Oh well, it was fun doing it and now I know I can actually do it. So yay! I've just finished my first scotch tape mani and for the first time it sort of came out nice. I did French tips. The only problem is that I can see the tip is much bulkier than the rest of the nail :-(. I shall be posting it on my blog tomorrow and putting in a link to your blog. Your tape manis are so amazing. Aww, thanks!! I'm glad you tried it. When doing the tip color, you do want to do one that is a 1 coater, and do as thin of a coat on he tip as possible. I can't wait to see it! I was so thrilled to find this website on Pininterest.com! I've never painted my nails often because of the time it takes to dry, but after reading this, I went out and bought a bottle of SV! Now, I'm laid up for a few days after surgery on my feet (nothing serious) and I'm going to spend the next few days practicing these designs. 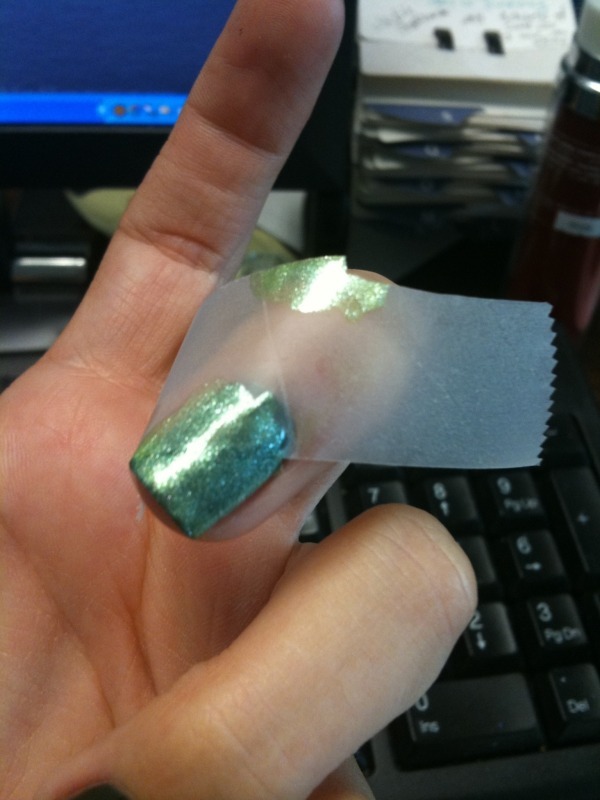 I never thought I could do anything as far as nail art, but this tape thing is brilliant! This is a fantastic blog and I'm going to share it with all my friends. I did it! First attempt at cool nails was a success! Thanks so much!! Great idea! Definitely going to try it! I'm so late to your blog - but I finally did the tape mani thing and love it! Used red door red (has a nice sheen to it) w/pure ice white for the tips. I've spent so much $$ getting my nails done and this was the first fun mani ever. How sad is that? LOL. Thanks! Got linked here a couple of days ago and found all your nifty tape manis. Had to try this one today, and it worked like a charm! :D Definitely gonna try more of this. I love your blog! I'm always looking for inspiration! Also I found that using electrical tape was much easier as it is "plasticy" (lol) it is easy to shape on the nail and I get perfect lines every time! Now if only I could find all the fun decals and tattoos you use in the UK! I love this! i actually tried it and it came out so perfectly! THANK YOU! I have just come across your blog via Pinterest & I LUV LUV LUV it...I've ordered the SV & the Lincoln Park after dark and will be trying a tape mani real soon. My only question is, how do you get your nails to have such a great shape without fakes??? Wow, thanks for this! After a few tries, I finally got the hang of taping! I used For Audrey to create a V french and I LOVE it! I'll be trying it out again tomorrow for a Thanksgiving inspired mani.. So excited! really good idea! 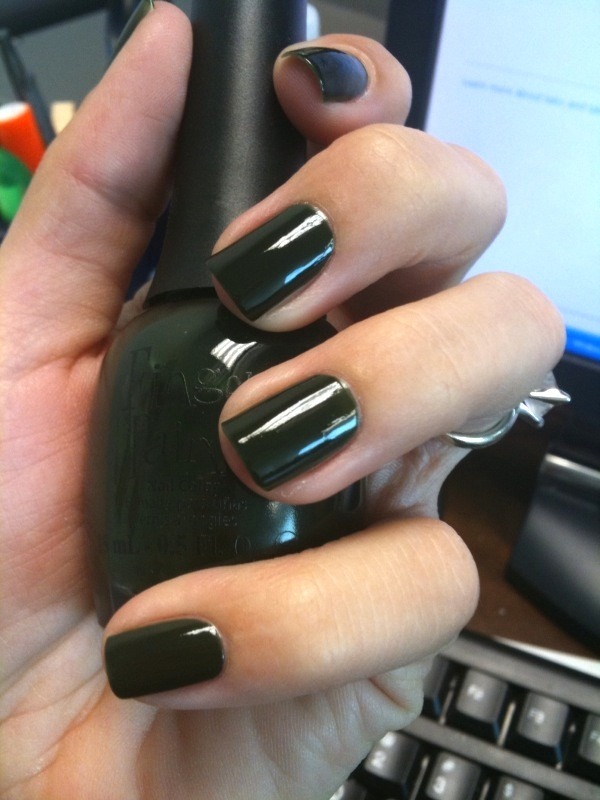 green is not really my colour, but your nails are beautiful!! Just featured this post in my blog :) Its a blog where I review things/ideas I find on pinterest! Would love you to come check it out!! Love your ideas! Very cool! Thx for the idea. someone please tell me what is "SV"? I tried this with pink nail polish with crackle over it and a nyc shiny green color over that.It got kind of gommy but still looks beautiful!!!! Thanks 4 that idea. Awesome! I'm obsessed with all things nails right now. Just scored a good deal off www.taaz.com for two free Zoya polishes. So now I might have to try this with the new colors. So fun with black base coat and sliver crackle for the tips. I just did this and it turned out pretty good! I used black as base color and second is a sparkly green. I bought SV and LOVE it. It was even on sale and I didn't know it. i just tried this for the first time! turned out pretty good first my first attempt! thanks for the great instructions & idea! :) i linked ur site when i posted the pics of my final product! I just wanted to ask how you do your French tips with tape? I'm trying not to spend a lot of money by going to a salon every time I want a French type manicure. I also use scotch tape, it's actually the best for this type of things. Even better than premade tip guidelines that they sell you. I'm looking for some beautiful yet easy to create nail designs that I can try on my short nails. Thanks for sharing this wonderful tutorial. I'll surely try! i really like your blogs, i have followed you! you may like our abHair ! Awesome nail designs, Last week my friend try powder nail design and full day talking about it , Now i am going to suggest her this design. OMG!! Check out all these colors!!! Maybelline Colorama #43, Playing with Flakies..
Black Light Polish.........1 word AWESOME! Sally Hansen Nail Prisms Part 2!! Holo Edition!